commonly cultivated are hybrids of the Chilean species Calceolaria crenatiflora. 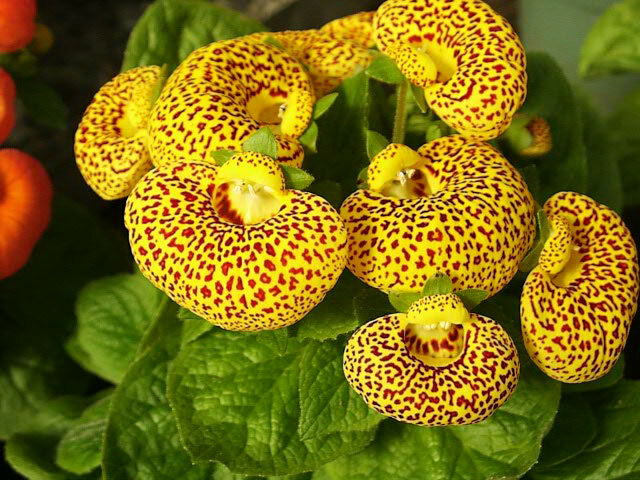 They are commonly known as Pocketbook Plants, Pouch Flowers or Slipper Flowers. Calceolarias are soft stemmed biennials that form compact, mounding plants that grow 6"-15" tall, depending on the cultivar. They have soft, light green, deeply textured 3" leaves with scalloped edges, but the foliage tends to disappear under the masses of unique, brightly colored, 1½" Pouch Flowers as they begin to open. Pocketbook Plants usually begin to show up in florist shops in the spring. With proper care, they will continue blooming indoors for several weeks but Calceolarias will seldom rebloom. Pocketbook Plants are biennial and are only hardy in USDA zones 9-11.
grown as annuals in patio pots and planters, or for border plantings. In the garden, Pouch Flowers should be grown in partial shade. A little morning sun is fine. enriched with a generous amount of compost and peat moss. but avoid wetting the crown to avoid crown and root rot. Apply an all-purpose, slow release type fertilizer at planting time. Provide protection from strong winds. Take precautions to protect your Pouch Flowers from slugs and snails. When growing Calceolarias as house plants, they should be planted in a peat moss based potting mix. Pre-fertilized potting mixes work well. where they will receive plenty of bright, indirect light, but not full sun. To provide additional humidity, place the planter on a tray filled with moistened pebbles. Water regularly to keep the soil evenly moist but never soggy, especially when your Calceolarias are in bud or bloom. Avoid getting water on the foliage and the crown. which should be taken in mid to late summer. 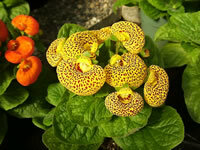 Calceolaria seeds require light for germination, so DO NOT COVER THEM! or at anytime if you plan to grow them as house plants. which only takes 5-10 days. After germination, only water enough to keep the growing medium barely moist to help prevent the damping off fungus. NEVER allow the soil to dry out completely!